The Northern Ireland Assembly was dissolved, bringing to end the first full term of devolved power in Northern Ireland for 40 years. Several of the 108 assembly members will not be seeking re-election, including former first minister, Ian Paisley, who is now known as Lord Bannside. In his final speech, he said it was time to get away from the things in the past that everyone now deplored. The election will be held on 5 May. On Thursday the speaker of the assembly reflected on its work over the past four years as it is set to be dissolved ahead of an election in May. Willie Hay thanked all the MLAs who are standing down and said some of them had given a lifetime of service. 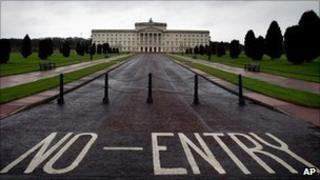 The assembly was dissolved at 0001 GMT on Friday ahead of the election.